The postal history of the Netherlands dates back to 1852 when it issued its first stamp with the head of King William III. During the Second World War the Netherlands were occupied by Germany. Stamp issues continued and a number of semi-postal stamps were issued. After the WW-II and liberation of the Netherlands on May the 5th 1945, the stamps in use continued till a new series of independent country was issued on 1st April 1946. This series was essential the same stamps that were issued by the Netherlands government in exile from Britain in 1944. 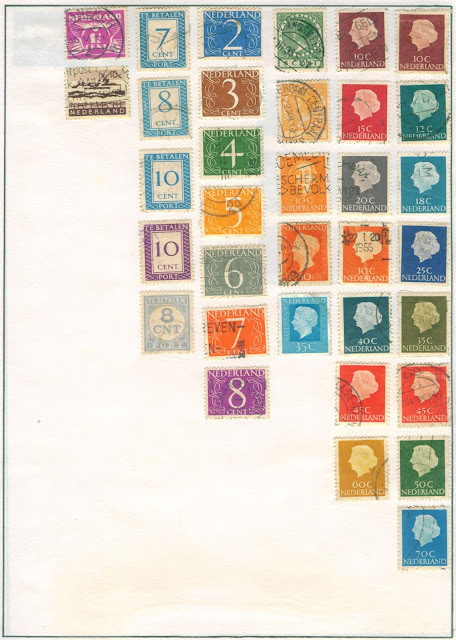 My collection has stamps of period of 1940s and 1950s. Two series are specially visible, one the numerical series and the other carrying the head of Queen Juliana. The numerical stamp series was designed by Jan van Krimpen. I do not have the numerical 1. The stamps carrying the head of Queen Juliana were first issued in 1953 and continued to be used till 1971.